Are you surprised to see me posting so soon again? I know I am! 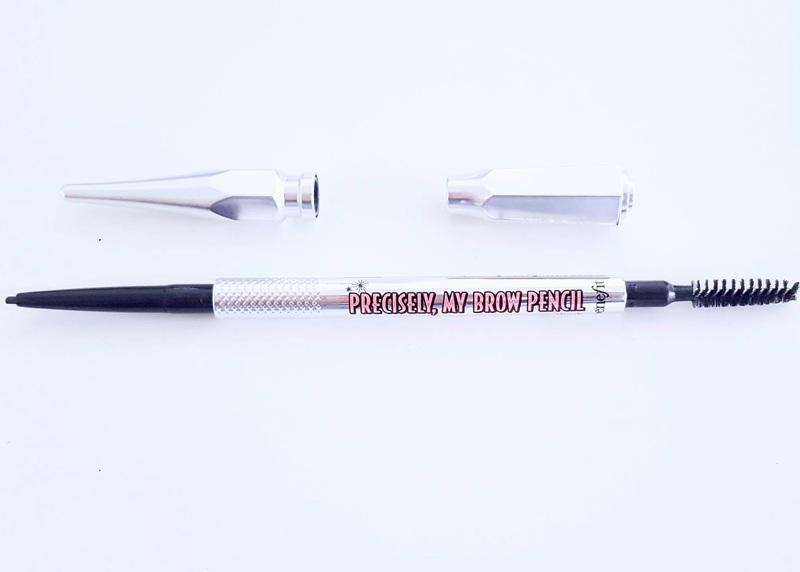 This week I wanted to review the Benefit ‘Precisely, My Brow’ Pencil. 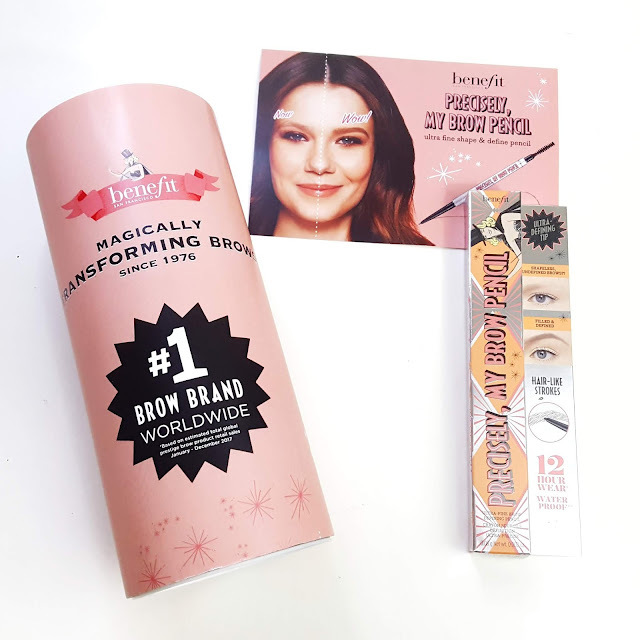 This was another product that I receive for free #freesample from the Topbox Circle in exchange for reviews, but this blog post was not a requirement—I’ve just decided that if I’m going to review a product anyway, I might as well have a post up so all of you can learn more too. I was sent the colour 4, which is described as a ‘warm deep brown.’ This seems to be a perfect match for me at the moment, but if your hair is super warm or cool, there are other colours available in their range. I’ve heard about this product for years and always assumed that the influencers raving about it were only doing so because they were sponsored. While they were sponsored, I now believe their claims because I love this as well! The pencil is really thin, which makes it super easy to create brow-like hair strokes. The formula isn’t super creamy, so it doesn’t smudge, but it’s also not too hard where you have to press hard. It’s the perfect consistency and so far I haven’t had any issues with it snapping. I only twist out the amount that I’ll need to use it, and when I’m done I twist it back down and put it away. The downsides? This is a high end product. That’s not necessarily a bad thing, but it does mean that you’ll be spending a lot of money for this, and if you do your makeup everyday, those price tags really add up. The spooley isn’t my favourite. The ABH spooleys are by far the best that I’ve ever used, but this Benefit one is a little bit too soft so while it brushes out the hairs, it doesn’t help blend easily. I’m not a cruelty free blogger and probably never will be, but I do use a lot of products that are, however, for some reason I assumed that this brand is cruelty-free, but when doing a quick Google search, I learned that it is not the case. So unfortunately, if you are cruelty-free, you can’t use anything from this brand. All in all I do really like this brow pencil. Will I purchase? Not for daily use, but yes for very special occasions. Something like this would be amazing for my wedding day (which is a few years away) so if I run out of it before then and don’t have a different product that I like more, I’ll probably buy this again. That being said, I do have a lot of brow products that I love that are more affordable so I don’t think this is life-changing and you can probably settle for a drugstore alternative. I hope you’ve enjoyed this review and seeing me post consistently for once in my life. In case it wasn’t already obvious, while I did receive this product for free I am NOT sponsored. One day when I eventually am sponsored by a company, I will make it very clear as I never want to throw out my morals, break the law or trick anyone. As usual, all opinions are 100% my own.